Foreign Waters: At Last, Water! Our quest to find water took us to the North Carolina and Tennessee border. In order to get there Astro took us along a road known as Dragons Tail.. or to us normal people route 129. Dragon’s tail is a steep winding road 11 miles long with 319 Corners, very popular with bikers, sports car drivers and police. 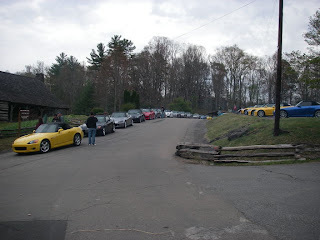 We had stumbled across a Honda S2000 rally which was taking place at the nearby resort. Astro did us proud unfortunately she wasn’t fast enough or beautiful enough to have her photograph taken by one of the few photographers stood at tight bends.. We love her though!! We camped the night at Fontana Village next to the largest Dam in the East, apparently the fugitive was filmed on that very dam!! First the Cheoah. 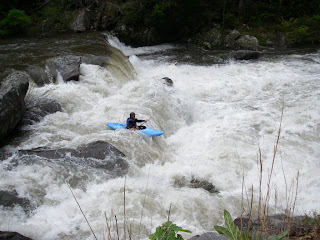 A frothing Adventure of class IV/ IV+ so the guide says. This certainly got Cheryl’s palms a little sweaty, and a few roadside scouting runs only heightened the anticipation (or nerves). Fortunately Cheryl didn’t have to rely on Simon to guide her down, as we tagged along with some local guys to show us the lines. The paddle proved to be an classic continuous 7 mile run. Certain sections were brush ridden, leading to adventures bushwacking routes in places. 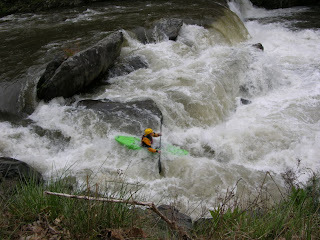 It ranged from mellow class 3 to some classic technical class 4 drops and big rapids. 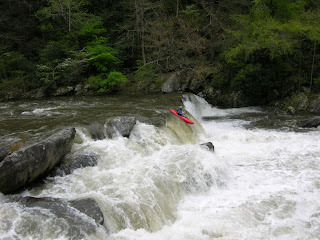 Some of the highlights included a 12ft Waterfall, offering a variety of lines from an easy angled chute, vertical drop, or creeky line. The final drop Yard Sale posed back to back holes to dodge which were the biggest holes of the run, which teased Cheryl’s first roll of the run out of her. A highlight to the day was running into one of Cheryl’s friends Steph Lind (they paddled in Mexico together). 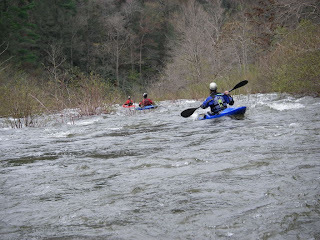 Our second paddle of the weekend was the Ocoee (Section 2) Again cold weather and miserable rain dogged our paddling, and our experience of the Ocoee was diminished slightly by this. This river is definitely one for a nice warm summer paddle. There were many good surf waves, and Hell hole was the highlight. Now we start the long drive – mainly on Interstate 40, heading through Tennessee, Georgia, Arkansas, Oklahoma, Texas, New Mexico, Arizona and California!! thought it had been a while since i checked your blog - wow you have been having a great time. the snake looks er cute. i like the look of the indian place - oh and the kayaking ofcourse.